DAILYKENN.com -- She said she didn't want to fight. But the black bully punched her anyhow. Turns out the blond-haired, blue-eyed cheerleader knew how to handle herself. And it was captured on video. 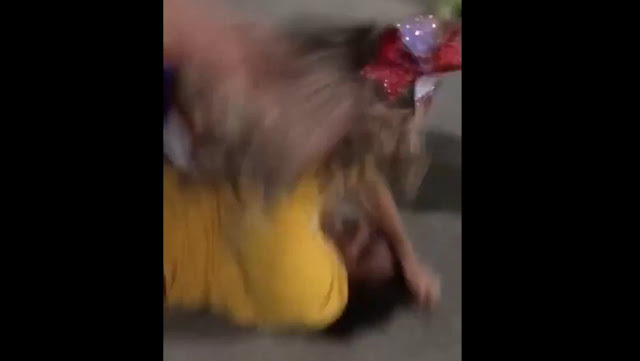 A pint-size cheerleader in California pummeled another girl who challenged her to a fight while still in her uniform, a dramatic video shows. The footage, posted early Saturday, purportedly shows Savannah Sprague, a cheerleader for Clayton Valley Charter High School, brutally beating an unidentified girl who had just challenged her to a fight as the cheerleader sat at a table in Concord while surrounded by other youngsters, some still holding their backpacks. “Do you want to fight?” the girl tells Sprague, according to the 92-second clip. “Don’t f–king touch me,” Sprague replies. “Break it up, break that s–t up,” one person says off-camera as the girls collect themselves after the fight. Weimerica twirls down the drain.....next she'll be charged with a hate crime because we're supposed to let negroes murder us because it would be racist to fight back. of course had 6 blacks beaten her nearly to death while calling her a crakka and a honky, they'd never call that hate or pressure anyone to charge negroes with a "hate crime" or even of being "racist". And by segregation i mean they can go to africa and get out of our white Christian European land. We will NEVER be able to coexist with them and the jews will make sure of it.